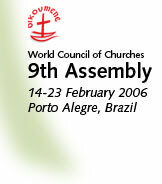 [ENS, Source: Lambeth Palace] Archbishop of Canterbury Rowan Williams has sent a greeting to the 9th World Council of Churches Assembly, which formally began on February 14 in Porto Alegre, Brazil. The message was read by Bishop Tom Butler of Southwark, England. Williams will travel to Brazil in time for February 17's group of sessions.